I am a devoted TurboTax follower but since I haven’t found any good TurboTax deal yet I will bookmark this offer from a competing company, H&R Block. My procrastination with tax return paid off this year and I might have just saved myself some money. This is probably not news any longer, but in case you missed it, Travelocity is sponsoring TaxCut Premium software download and right now you can get it using this link for free bundled with DeductionPro. Make sure to do two things when you place your order with H&R Block. 1. Use Internet Explorer . FireFox got stuck at the last step for me, and I have heard that other people had similar problems. 2. Remove Extended Download Protection from your cart. It will be their by default. If you don’t remove it, you will have to pay $3.99 for your order. I already ordered and received my files (the download starts right after your order is complete) but didn’t install them yet. 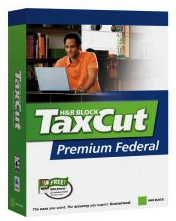 Still hesitating if I should use one of TurboTax discounts on the online version (my usual choice) or give TaxCut a try this year. About.com has the most complete comparison of TurboTax and TaxCut I could find. I recommend reading it if you are undecided like me. Another important thing is importing your last year tax data. From the review, TaxCut does import from TurboTax. That for sure applies if you used a desktop version of TurboTax last year, but I am not sure what happens if you used TurboTax online version. Has anyone had experience with it? Both FatWallet and SlickDeals have ongoing discussions which will provide you more details on this offer. Update: I have updated this list for 2007 tax season. Go to TurboTax online deals for an updated version. 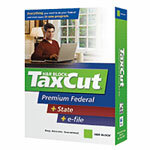 It is the tax time again and as usual I will be in search for discounts on tax preparation software. As with everything else I try to do the taxes myself. It helps me to understand better how the system works and to make smarter financial decisions down the road. Since I love to do everything online some time back in 1998 I did a research on what online tax preparation is the best and TurboTax by Intuit came out the winner. Ever since I really don’t have much of a choice (not that I complain) since TurboTax saves my time by exporting the last year data to the new return application and I would hate to have to enter all of it again if I had to switch. So I fired my favorite bargain hunting tool and did a search on TurboTax deals. Here is a roundup of what I found. Most of these deals are really promotions for customers of other services or programs but judging from the last year many will work even if you are not a customer (I will mention exceptions). Important: Make sure to start and finish your application using the same link. The offer will not work if you go to TurboTax directly to continue the application you started using one of the links below. In addition Intuit is running a Free TurboTax promotion which is a whole different product. It is lacking many of the advanced features and will probably fit college students or other folks who are single and rent (vs own) their home. Click here to learn more about the limitations. Do you know other TurboTax discounts? Add them in your comments.